Dinahosting Review 2019: Is Dinahosting a Good Hosting? Dinahosting offers an abundance of features in their hosting packages and have quite a large customer base. They offer unlimited transfer for both their email hosting and Advanced shared hosting packages, easy migration from other hosting providers, and a good live chat -- all of which can be easily tested using a 15-day free trial account. Dinahosting is a Spanish website hosting provider. It was established in 2001 and has since billed over 13 million dollars in revenue. Since their inception, they’ve served nearly 140,000 customers and registered over 254,000 domains. Their website is available in English, Spanish, Catalan, and Galician. Dinahosting lists all the features of their hosting packages in detail. In their Advanced SSD shared hosting package, you get unlimited emails, unlimited FTP / SFTP accounts, and unlimited databases. Migrating your existing website to Dinahosting is made easy with the help of the portability wizard. Plus, if you’re moving your website to their hosting service, you get three months of free hosting and a year of free WHOIS protection when you purchase one of their annual packages. You can back up your website through the easy-to-use cPanel whenever you need to, so you don’t have to rely on others to back up your important data. Using email and chat has been made easier thanks to an intuitive and flexible interface through which you can manage every aspect of your account. Dinahosting’s modern infrastructure affords you the use of PHP 7.2, lightning-fast SSD storage, and Varnish Cache to enable faster page loading times. If you run out of resources and want to upgrade to a better package, just get in touch with their support team and they’ll help you get the features that you require. 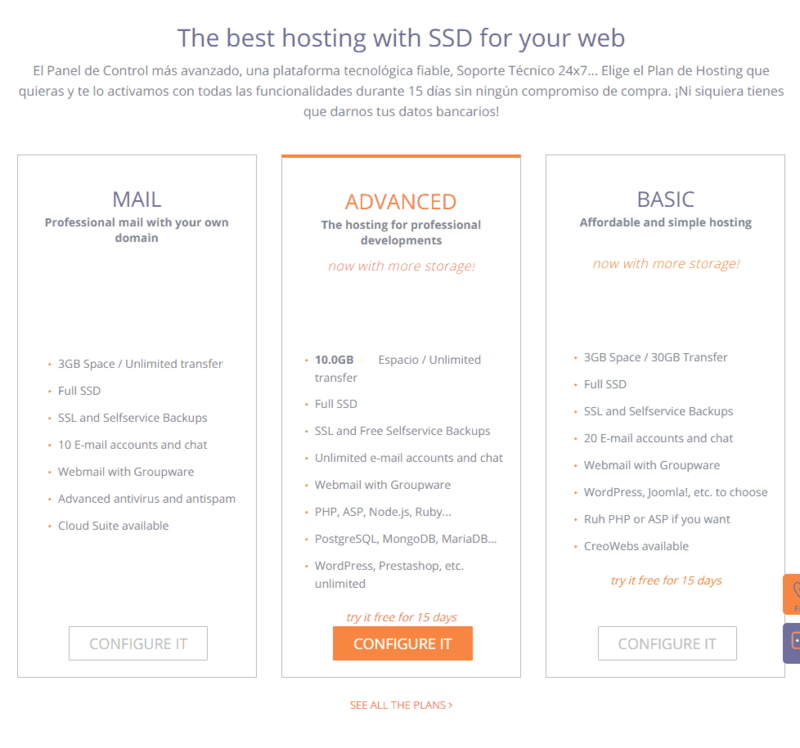 Dinahosting has divided their SSD shared hosting packages into three main categories named Mail, Advanced, and Basic. The mail package is only limited to email accounts, so I’ll consider the other two here. What I like about them is that they list their features in detail so you know exactly what you are getting in each package. They offer limited storage in all their packages, but you can get unlimited traffic in the Advanced package. The Advanced hosting package offers you the choice of Windows or Linux-based hosting. The backup service is included for free. I find their Advanced package a bit on the expensive side, considering they only offer limited disk space. The Basic hosting package is rather limited. For instance, you won’t get any databases, and you’ll only get support for a few programming languages. If you require more complex scripts on your website, you’ll have to opt for the more expensive package. On the bright side, they do offer a 15-day free trial with no credit card details required, so you can easily test out either package to see if they fit your needs. They offer support in the form of a 24/7 telephone hotline and live chat. However, the person I communicated with did not speak a lot of English. He was very friendly and answered my questions. However, I was expecting them to transfer me to someone who could speak better English, and they never did. Still, full marks for the commitment he showed. I couldn’t find a way to contact them through email, but it’s quite possible you can get in touch with them through email once you log in. Dinahosting is on the expensive side when you consider that they do not offer unlimited storage and you have to pay extra for features that other hosting providers offer for free. However, they do have a broad range of packages that offer Spanish businesses scalability and reliability, especially when catering to the local market. Wondering how Dinahosting stacks up against other Web Hosting companies? Enter any other Web Hosting company and we will give you a side-by-side comparison.